Play begins at 9am, please arrive inside by 8:45am to be seated as a group. The show runs approx. 1 hour and 45 minutes. I will email a meeting area and parking details closer to the date. RSVP and Pay by September 27, 2018. No refunds after this date. Only 25 tickets are reserved for our group. RSVP early. Payment guarantees your RSVP. RSVPs without payment will not be held. The Grissom Theatre Department presents the classic children’s story, Charlotte’s Web, based on the book by E.B. White, and adapted by Joseph Robinette. This play is based closely on E. B. White’s children’s classic novel. All the enchanting characters are here: Wilbur, the irresistible young pig who desperately wants to avoid the butcher; Fern, a girl who understands what the animals say to each other; Templeton, the gluttonous rat who can occasionally be talked into a good deed; the Zuckerman family; the Arables; and most of all, the extraordinary spider, Charlotte, who proves to be “a true friend and a good writer”. 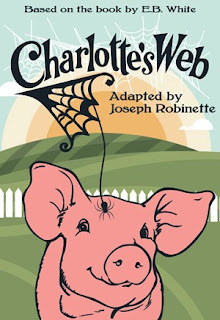 Determined to save Wilbur, Charlotte begins her campaign with the “miracle” of her web in which she writes, “Some Pig”. It’s the beginning of a victorious campaign which ultimately ends with the now-safe Wilbur doing what is most important to Charlotte.